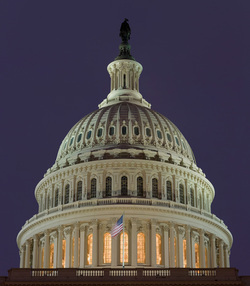 Leaders of the US House Energy and Commerce Committee have reached agreement with FCC Chairman Tom Wheeler to amend the Commission's plans -- announced in March -- to close a number of FCC field offices. Under the revised plan, the FCC will keep 15 of its 24 field offices open. According to a Committee media release, the plan would "ensure better rapid response capabilities for the West, provide a mechanism for escalating interference complaints, improve enforcement of the FCC's rules against pirate radio operators, and prevent the Commission from transferring field office jobs to FCC Headquarters." The FCC had been under pressure from lawmakers and others to step back from its plan to shutter the field offices. "We found a good solution that makes sense. 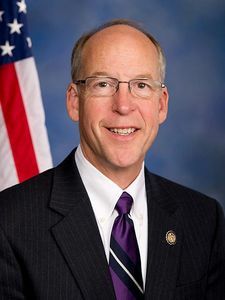 These changes will keep field offices open in strategic locations and help ensure that the commission can fulfill its responsibilities to the public and public safety communities," said Communications and Technology Subcommittee Chairman Greg Walden, W7EQI. "This agreement strikes a balance between the important work of FCC field agents and streamlining field operations to ensure the efficient use of taxpayer dollars. Positive outcomes often result from collaborative work. This agreement represents just such an effort." As a result of the announced agreement, a June 11 hearing of Walden's subcommittee to address the proposed closings was cancelled. ARRL General Counsel Chris Imlay, W3KD, was among those prepared to testify at the session. The closure plans were revealed earlier this year via an apparently leaked internal FCC Enforcement Bureau (EB) memorandum that indicated the Bureau planned to ask the full Commission to cut two-thirds of its field offices and eliminate nearly one-half of its field agents. At the same time, the Bureau would develop a so-called "Tiger Team" of field agents as a flexible strike force it could deploy as needed. After the League learned of the field office closure plans, ARRL CEO David Sumner, K1ZZ, expressed dismay at the proposals, coming, he said, "at a time when the Field staff is facing ever-increasing challenges." Sumner also had expressed concern "that there is already no sense of urgency in the FCC's enforcement activities targeting spectrum polluters, such as utilities with noisy power lines, or the few violators in our own ranks." The League has been working behind the scenes at the FCC and on Capitol Hill to make a case that more enforcement leads to better compliance in all services. Under the proposals, initiated last fall, the field office geographic footprint would have been reduced from 24 sites to 8 sites, with the EB set to "pre-position" equipment in several other strategic locations. Offices already slated to remain open are New York City; Columbia, Maryland -- the site of the Bureau's HF Direction-Finding Center; Chicago; Atlanta; Miami; Dallas; Los Angeles, and San Francisco. The other offices the FCC plans to keep open have not yet been announced. Read more. European Space Agency Astronaut Samantha Cristoforetti, IZ0UDF, who returned to Earth June 11 with her crewmates -- NASA Astronaut Terry Virts, and Russian Cosmonaut Anton Shkaplerov -- has set a new record for the longest single space mission by a woman. Cristoforetti's duty tour on the International Space Station was extended by about a month, following the failure in late April of the Russian robotic Progress 59 cargo spacecraft to reach the ISS. The Progress went out of control, eventually burning up in Earth's atmosphere. "Early start into Day 200 in #space," Cristoforetti tweeted before boarding the Soyuz vehicle for the trip home. "It's been an amazing journey, thx for coming along! Now time to go home to Earth." While in space, Cristoforetti, 38, conducted several Amateur Radio on the International Space Station (ARISS) school contacts. She was to have returned to Earth in early May. 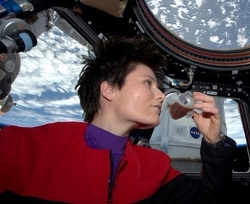 Cristoforetti, from Italy, set the record on June 6, when she surpassed the previous record of 194 days, 18 hours, 2 minutes, logged by NASA astronaut Suni Williams, KD5PLB, during her time aboard the International Space Station in 2007. Cristoforetti's new record will come up just short of 200 hours, counting her flight back to Earth. Cristoforetti, Shkaplerov, and Virts took off late last November from Baikonur Cosmodrome in Kazakhstan. Her departure from the ISS will leave Russian cosmonauts to support the ARISS program until late July, when Kjell Lindgren, KO5MOS; Oleg Kononenko, RN3DX, and Kimiya Yui arrive at the ISS as part of a scheduled crew rotation. Before flights were reshuffled, they had been scheduled to arrive in May. All three are set to return December 22. NASA astronaut Scott Kelly and Russian cosmonauts Mikhail Kornienko, RN3BF, and Gennady Padalka, RN3DT, arrived on the station in March as part of the Expedition 43/44 crew increment. Kelly and Kornienko will remain on the ISS for 1 year. Padalka also will return to Earth in December. The next Russian cargo craft, Progress 60, will launch in early July to deliver several tons of food, fuel, and supplies. The space station has sufficient supplies to support crews until the fall. 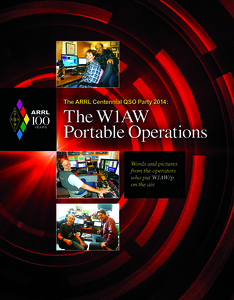 The W1AW Portable Operations commemorative booklet, which chronicles the central activity of the year-long ARRL Centennial QSO Party, is now available. The Centennial celebration may be over, but the memories can live on with this keepsake publication, which features 40 pages of stats, stories, and photos from the hams who put W1AW/p on the air, bringing enjoyment to many thousands of hams. The W1AW Portable Operations is available from the ARRL Store (ARRL Item No 0383; $9.95 retail), or call 860-594-0355 (toll-free in the US, 888-277-5289). E-mail ARRL Publication Sales for more information. A well-known voice in the Amateur Radio news media has gone silent. 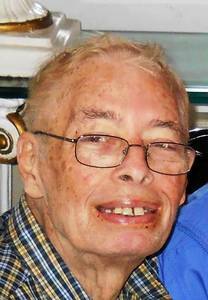 Bill Pasternak, WA6ITF, of Santa Clarita, California, died June 11 following a period of ill health. He was 73. Pasternak was co-founder (with Jim Hendershot, WA6VQP) of Amateur Radio Newslineâ¢ (formerly The Westlink Report) ham radio news webcast and a frequent presence at Amateur Radio conventions. Pasternak served as Newsline's managing editor and as an occasional newscaster. ARRL Rocky Mountain Division Director Brian Mileshosky, N5ZGT, became acquainted with Pasternak at the Albuquerque hamfest, and in 1997 was named Newsline's "Young Ham of the Year" (YHOTY). "An incredible man, ham, and one of Amateur Radio's too-few giants, who woke up every day to make the hobby better for everyone, especially its legacy -- youth," Mileshosky said of Pasternak. "I've enjoyed the energy he put into keeping hams informed via Newsline and have been honored to give back to his Newsline Young Ham of the Year Award program, since being asked by him to sit on its judging panel well over a decade ago." A Brooklyn, New York, native, Pasternak became a radio amateur in 1959 as WA2HVK. "I love the hands-on approach to ham radio and built my very first transmitter using parts salvaged from an old Dumont television set," Pasternak recounted in an online biography. He eventually made his career in television engineering and production, retiring from KTTV in Los Angeles in 2012. Pasternak was the spark plug behind the all-volunteer Amateur Radio Newsline bulletin -- which was relayed on repeaters around the US and elsewhere -- as well as the creator and administrator of the annual Young Ham of the Year Award. He was the author of three books and served as a writer/producer on several educational films and videos, including the award-winning "Amateur Radio Today." In earlier years, he wrote the "Looking West" column for 73 Amateur Radio Today Magazine and the "VHF, FM, and Repeater" column for WorldRadio. Ham Radio Now devotes its latest episode to reflections on Bill Pasternak's life (Click on image to view). Pasternak was the only person ever chosen to receive both the Dayton Hamvention Special Achievement (1981) and Radio Amateur of the Year (1989) awards. Survivors include his wife of 43 years, Sharon, KD6EPW. ARRL Hudson Division Director Mike Lisenco, N2YBB, remarked, "Some would say that you measure an individual by the amount of wealth they've acquired. I would say that the true measure of value of an individual is by the amount lives they've touched. If that is the case, then Bill died a very wealthy man." The future of the Amateur Radio Newsline broadcast, out of production since its May 22 edition, has not been determined. Ham Radio Now producer Gary Pearce, KN4AQ, has devoted his latest webcast episode to reflections on Pasternak's life from six people who knew him well. Read more. result of an accidental electrocution while he was working on an antenna at his home. He was 50 and had been a radio amateur since 2008. Survivors include his wife, Jane, WV8JH. A successor to Hardy as West Virginia SM will be appointed. A new Section Manager has been appointed in New Mexico. Ed James, KA8JMW, of Albuquerque, was named on June 11 to succeed Bill Kauffman, W5YEJ, who has resigned citing increased family responsibilities. Kauffman had served as New Mexico's SM since 2012, and was the Section Emergency Coordinator for many years prior to that. James will complete the remainder of the current term, which continues through the end of the year. ARRL New Mexico Section Manager Ed James, KA8JMW. ARRL Field Services and Radiosport Department Manager Dave Patton, NN1N, made the appointment after consulting with Rocky Mountain Division Director Brian Mileshosky, N5ZGT, and Vice Director Dwayne Allen, WY7FD. A ham for 35 years, James has served as an Assistant Section Manager of New Mexico since 2012, and currently serves as an Assistant Director in the Rocky Mountain Division. 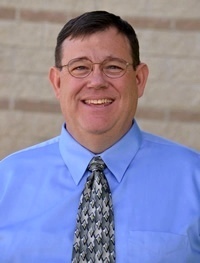 He recently concluded a 30-year electrical engineering career at Sandia National Laboratories. James comes from a ham radio family. His late father was WD8MMG. 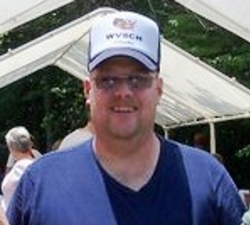 His wife Carol is N5ZYP, and all five of the couple's daughters hold ham tickets and are ARRL members. Field Day is among his passions. "Most weekends I can be found operating from somewhere in the mountains of New Mexico," James said in his QRZ.com biography. "I love operating from the field." Petitions to nominate candidates to serve as New Mexico Section Manager for the next 2-year term should be submitted to ARRL Headquarters by September. Two Oklahoma Amateur Radio clubs got together during the June 13-14 weekend to support communication for the Saint Francis Tulsa Tough cycling event. Some 1400 riders registered for the road events. More than 20 volunteers from the Tulsa Amateur Radio Club (TARC) and the Tulsa Repeater Organization (TRO) carried out radio operations to support logistics and rider safety over the 2-day competition. Marking its 10th anniversary this year, the Tulsa Tough serves, in part, as a public health-awareness campaign of Saint Francis Hospital. Road events range up to 110 miles in a loop circuit that begins in the center of Tulsa and covers four counties in two different rides. Among other things, hams help to recover riders who are unable to complete the course. At the command post, net control operators use ham radio to coordinate support activities ensuring rider safety. Serving as the backbone for radio operations was TARC's large, regionally linked UHF system. Complementing that was TRO's VHF system, with remote receivers to serve the logistics net of operators stationed at rest stops along the route. These operators monitor and report on rider status and supplies and relay any medical information from the on-scene nurse. TRO also provided a smaller, linked UHF system, on the second day of the event to cover areas at points most distant from Tulsa, in eastern Osage County. Live streaming video of a Tulsa Tough event via Icedot.org. In the months leading up to the event, Tulsa County ARES Assistant Emergency Coordinator and TARC President Bart Pickens, N5TWB, served as the primary Amateur Radio interface with event organizers. This included recruiting volunteers, establishing an operations plan, and arranging for radio equipment and antennas to outfit vehicles. 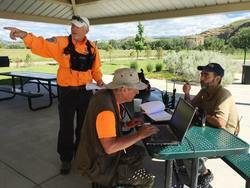 Colorado Amateur Radio Emergency Service (ARES) volunteer Neal Tew, KD0MBL, responded on June 11 to a call from a search-and-rescue team that needed a radio operator. Colorado ARES R5D1 Emergency Coordinator Amanda Alden, K1DDN, said she got a call on her local UHF repeater from Dave Dickens, KE0AEG, and Pat Caulfield, KE0AEE, from Fremont County Search and Rescue. "SAR was conducting a search for a possible body in the Arkansas River," Alden said. "They were short-handed and wondering if any ARES personnel could operate their radios during the search." She stressed that the volunteer would not be operating on Amateur Radio frequencies, just operating the search and rescue team's radios. "The Arkansas River is a very popular river to raft, with over 150,000 rafters a year," Alden told ARRL. "The Colorado snow runoff has just begun and the river is running at its highest and fastest of the year." So, Alden called Tew, whom she referred to as "the best operator I knew outside of my district," and he was available and agreed to help. He was assigned to the Incident Command Post and handled and logged all traffic on the state digital radio network for about 4 hours. "He did a fantastic job and made ARES shine for our first time working with Fremont SAR," Alden said. Tew worked the mission from about 0930-1330. Caulfield said Tew was a quick study and was up and running within 15 minutes. Alden said that searchers were unable to locate anything, and the search was eventually called off due to high water. Once again this year, a group of medium-wave experimental licensees will transmit greetings on 630 meters during the ARRL Field Day weekend, June 27-28. While the 472 to 479 kHz band is not yet available for Amateur Radio use, John Langridge, KB5NJD, said he'd like to continue promoting awareness of the proposed ham band. In April, the FCC proposed a new 630 meter Amateur Service MW allocation at 472 to 479 kHz, and it allocated a new LF band, 135.7 to 137.8 kHz -- both on a secondary basis. Langridge this year is hoping that some LF experimenters will also take part in the exercise. No Amateur Radio operation will be permitted in either band until the FCC establishes specific operating rules. Some of the stations involved in the Field Day activity, including Langridge, are associated with the ARRL 600 Meter Experimental Group (WD2XSH). ARRL 600 Meter Experiment (WD2XSH) Coordinator Fritz Raab, W1FR, said that while the FCC's April Report and Order, Order, and Notice of Proposed Rulemaking is a step in the right direction, it could be some time before hams have a 630 meter ham band in the US. "With that in mind," he told ARRL this week, "we plan to renew the WD2XSH license and continue operations much as we have been, until such time as the 630 meter band becomes a reality." Langridge said last year he got about 60 reports on his own transmissions from Texas. "It seems the longer we do this, the more legs that grow on it, and participation has really increased," he said. The point is to make active, relevant signals available to existing Field Day stations that might have a large pool of operators, many still having no idea that anything is going on below the broadcast band." Langridge said Field Day stations could try using an HF transceiver capable of covering the 472-479 kHz range to listen for participating stations. He stressed that stations can use "whatever antennas that they have on site -- a dipole, a tribander, a vertical, whatever -- as the impedance mismatch may help improve the signal-to-noise ratio enough for effective copy." Langridge said that in 2014 he received an Argo screen shot of his CW signal from Utah. "Reporting is important, since we all like to know who is listening and how we are doing," he said. Stations hearing any of the MW (or possible LW) Field Day "greeters" may report their reception online. Read more. Registration is open for the 15th USA and 8th IARU Region 2 Amateur Radio Direction Finding (ARDF) championships, August 27-30, in Elbert, Colorado. The event will take place at the Peaceful Valley Scout Ranch, a 3300-acre site at 7000 feet elevation, about 40 miles southeast of Denver. An optional ARDF "training camp" will take place on Monday through Wednesday, August 24-26, just prior to the competition, with separate morning and afternoon sessions planned for each day. Participants may attend as many sessions as they wish. Training sessions will concentrate on how to take reliable bearings, interpret reflected signals, and determine likely transmitter locations, as well as on course strategies, route choices, and other essentials for success. The championship competition begins on Thursday, August 27 with foxoring -- a combination of RDF and classic orienteering on 80 meters, in which participants navigate to marked locations on their maps where very low power transmitters can be found nearby. A 10-transmitter short-course sprint competition on 80 meters takes place the next day. The classic full-course 2 meter main event gets under way on Saturday morning, with five transmitters in a very large forest. The banquet and awards presentation follows that evening. A similar full-course 80 meter main event takes place Sunday morning; an awards presentation follows. The International Amateur Radio Union (IARU) sets ARDF championship rules. Participants are divided into 11 age/gender categories. In classic ARDF championships, competitors start in small groups made up of different categories. Working independently, they navigate through the course -- a distance of between 4 and 10 kilometers -- seeking hidden transmitters. They plot their direction-finding bearings on provided orienteering maps that show terrain features, elevation contours, and vegetation type. 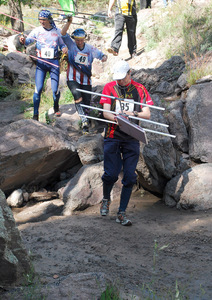 The USA ARDF Championships are open to anyone of any age who can safely navigate the woods alone; a ham radio license is not required. Participants compete as individuals and bring their own direction-finding gear to the events. HamGallery Dayton 2015 Photo Gallery is Now Available: Tom Roscoe, K8CX, reports that the Dayton 2015 Photo Gallery has been posted on his HamGallery website. Tom's Dayton photo galleries date back to 1997 and contain nearly 4500 photos. You can access these annual photo databases from the HamGallery homepage, and you can search within individual annual photo galleries. Tad Cook, K7RA, Seattle, reports: Depending on which measure we choose, solar activity weakened a little or increased slightly over the past week. The June 11-17 average daily sunspot number declined from 112.4 over the previous 7 days to 99.9, while average daily solar flux rose from 131.4 to 135.9 over the same period. The current outlook from NOAA and USAF has solar flux at 135 on June 18; 130 on June 19-21; 125 on June 22; 120 on June 23-24; then 115, 90, and 95 on June 25-27; 100 on June 28-29; then 110, 115, and 120 on June 30-July 2; 125 on July 3-4; 120 on July 5-6; 125 on July 7, and 130 on July 8-10. Flux values then dip below 100 for July 19-24, and rise above 100 after July 26. All of this looks pretty weak when compared to Cycles 21-23, but is normal for Cycle 24, which peaked in April and May of 2013 and again -- about 40 points -- higher in February and March of 2014. This is based on a 3-month moving average of Boulder sunspot numbers. For a straight monthly average, we see a May 2013 peak of 125.6 and a February 2014 peak of 174.6. Since then, numbers have steadily declined, with the weekly sunspot number average for the last 7 weeks at 60.9, 146.9, 92.1, 56.1, 34.3, 112.4, and 99.9. Predicted planetary A index is 12 on June 18; 5 on June 19-July 4; then 25, 15, 12, 10, and 5 on July 5-9, and 8, 15, 12, and 8 on July 10-13. After this, planetary A index drops to 5, where it will remain until early August, when it is predicted to rise to 25, indicating a geomagnetic storm. But early August seems a long way off. At 0933 UTC on June 18, SpaceWeatherLive.com issued a proton storm alert, saying a small, S1-class proton storm was in progress. Indeed, looking at their Electron Proton and Alpha Monitor (EPAM) display at 1000 UTC, we see a rise in activity beginning after 0400 UTC and continuing. In Friday's bulletin, look for reports from readers and an updated forecast. Send me your reports and observations.